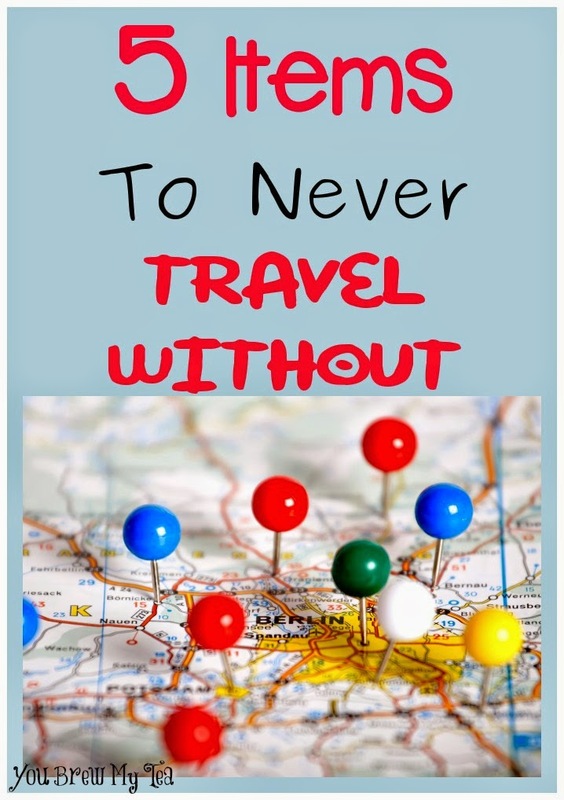 Whether you are heading out for a work event, or loading up the family for a cross country road trip like we are in a few weeks, these 5 Items To Never Travel Without are important for every person to know. While your time on the road will likely be easy and fun, you don’t want to make the mistake of finding yourself without needed items in an unfamiliar place. Make sure to tuck these simple things away for easy travel for your family this year. Trust me, they can come in handy when you least expect it. EMERGENCY CONTACT INFORMATION: Make sure you always carry a list with your own personal contact information, but also that of your spouse, parent, siblings or other significant other in your life. This list is for those who may need to be contacted in case something happens to you or your family while on the road. For us that means current phone numbers for our parents, my sister and my Beau’s close cousin. We also include each others numbers and relationship so if something happened to one while the other was apart from them it would be handy. MEDICATIONS AND SPARE PRESCRIPTIONS: Not only do you need to make sure you have your current prescriptions in your luggage, having a spare paper prescription is recommended in case you lose yours or run out before you return home. This makes it much easier to head to a local pharmacy when you reach your destination. Also make sure you have a list of all current medications, dosage and times they should be taken. Having your doctor and pharmacy contact information handy on that list is also a great idea just in case something happens. Even if you don’t take regular medications for daily conditions, something like a lost birth control pack or an inhaler for asthma could be a frustration if missing on vacation. WILL AND POWER OF ATTORNEY: While we hate to think morbidly, it is always smart to prepare for any emergency. This includes having a copy of your will or power of attorney with you for emergency use. If your spouse or significant other doesn’t have custody of your children (step parent or non parent without legal guardianship) this could be very important. Having something that handles who can make what decisions should you be rendered unable is very important. Check with your lawyer if you haven’t had this drawn up yet. Other options for simple forms include online sites like Legal Zoom to help you prepare a simple form as needed. INSURANCE INFORMATION: Medical, Vision, Life and Auto Insurance are all very important to have on hand when you are traveling. You never know when they might be needed and having to ask someone back home to search for policy numbers isn’t always easy. AAA OR OTHER ROAD SIDE ASSISTANCE PROGRAM: The $100 or less annual expense is a great way to cover yourself and others while on the road. From a simple tire change to a tow when needed, having these covered without out of pocket expense when you travel can save you literally thousands of dollars on the road. A few years ago we found ourselves headed to my father in laws house about 5 hours North of our home. Right at the half way point of our journey, our car died on the freeway. We ended up towing the car to a local shop and having a part attached that had come unhooked. It was a simple fix, but one that wasn’t obvious to the naked eye. The mechanic didn’t charge us much, but the towing fee was terribly high. Had we had AAA at the time we would have had no charge at all for towing and been out only a few dollars for the mechanic to fix the issue. We immediately purchased a policy when we got home from that trip and have been thankful for it on many occasions since. No matter what your needs or situation may be, all of these 5 items to never travel without will apply to you. Make sure to pack them together and in a place that is easy to get to when needed. Including a copy of everyone’s ID is also a great idea for extra safety when traveling with children. Lengthy vacations and simple road trips can be great places to make special memories with your children this year. Don’t be caught on the road without these necessities. Good, solid advice. Pinned this and plan on referring back to it next time I travel. I tend to get so caught up in anticipation of fun that these are the types of things I’d forget. Great tips! I didn’t think to bring documents such as a will or power of attorney, but that makes a lot of sense. No need to make a bad situation worse by not being prepared! Awesome tips- and so important. While you don’t want to think about anything crazy happening… you just never know! Great travel tips, Katie! I agree, having AAA is a good service to keep on hand for road trips. It’s great that they offer discounts to a lot of hotels and other travel perks too.